I recently got a fun-cube pro plus sdr dongle. 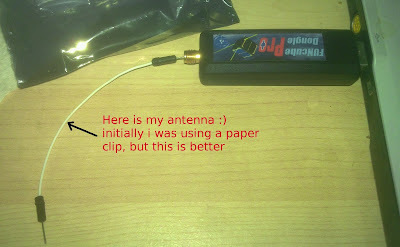 As i dont have an external antenna, i need to test the device with wide band fm broadcast stations (Although funcube pro is not really meant for that purpose) So i hooked up the device with my sophisticated antenna (see the image below :)) and connected to the gnuradio. My search for an example gnuradio sketch ended up in vain. I tried some of the receiver layouts, which was mainly for narrow band fm,which i realized at a later time point. Things turns so simple when you have an example sketch to start with. 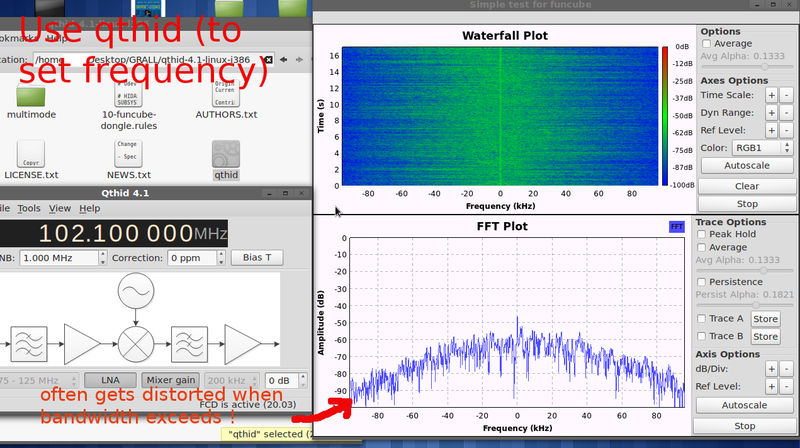 So i was forced to test with a windows only, powerful sdr software (sdr#). 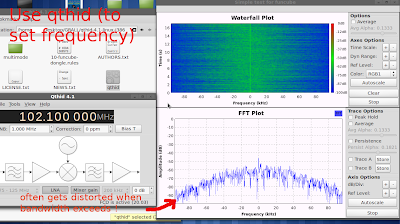 But using gnuradio and linux offers a lot more flexibility and learning oppurtunities. To start with, connect the dongle to usb port and place an antenna, a piece of wire in to the sma connector. If you dont have a funcubedongle, you can still try the sample capture file and the attached grc files. Note: As of v3.7.4 of gnu radio, you may get an error stating that -Error: Block key "blks2_wfm_rcv" not found in Platform - grc(GNU Radio Companion). This is because in newer versions, they have moved it under modulators, WBFM receiver. Set the quad rate to 192000 and audio decimation to 48. Instead og the grc code below, if you use the version from git, i have updated it to the latest. www.riyas.org © 2013. Simple theme. Theme images by blue_baron. Powered by Blogger.